Attention, Happy Checkout App users! We’re happy to announce that we’ve just added one of our most popular feature requests to the app: Pinterest support. If you’re not already using Happy Checkout, check it out! The app allows you to customize your “Thank You” page so that you’re not stuck with the boring Shopify template that essentially wastes your customers’ time. Instead, the Happy Checkout app allows you to make your “Thank You” page engaging and social by including the ability to pin products, connect on Facebook, tweet about purchases, view thank you videos from YouTube and Vimeo, subscribe to your newsletter, and more! 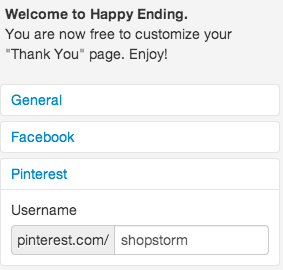 This will add the Happy Checkout Pinterest field to the “Thank You” page. Customers will then be able to select the product from their order they’d like to pin and click the “Pin it!” button. That’s it! The Pinterest integration is back and easy to use smile . Pin away!